Several lines of evidence suggest that autoimmune phenomena may underlie a subgroup of cases with chronic pancreatitis (CP). 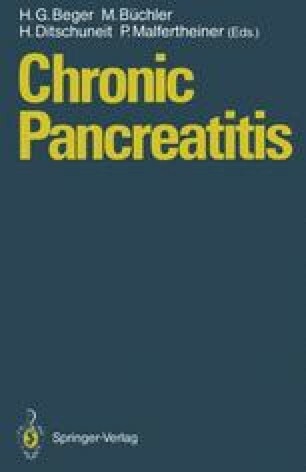 In particular, autoantibodies (AB) to pancreatic acinar cells and ductal antigens have been described [7, 8, 11, 20], and lymphocytes specifically sensitized to crude pancreatic antigens have been detected in patients with CP [15, 21]. Lymphocytic infiltrates with activated cells can be detected in the exocrine pancreas, and besides hyperexpression of HLA class I molecules, aberrant expression of HLA-DR molecules on exocrine pancreatic cells has been described in CP [3, 6].